Our last day in New Zealand in its large multicultural city Auckland. The ship moored right at the bottom of the main street, Queen Street. 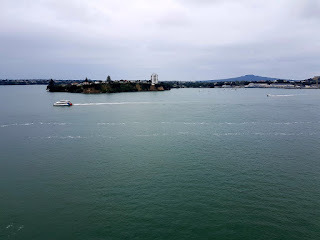 Auckland is on the southern side of Auckland Harbour but greater Auckland is spread around the harbour and ferries are an important part of public transport. I see nice old buildings. I see modern new buildings. I see construction of an underground railway. There are people you meet along the way in life that make a real impact. One couple that I’ve known for 7 years or so now have become very good friends and very important to me. They are the couple I studied to become a marriage celebrant for and there aren’t many people I would have done that for. What a terrible thing the fire was in the Church of Notre Dame in Paris. There is a heartbreaking emotion about the cathedral from the people of France, Francophiles around the world and those who love historic buildings. Even during a alcohol fuelled lunch on The Seine with a female couple? travelling, one from Scotland and the other from Texas, I managed to snap these two photos, oh look, there is Notre Dame, excuse me for a moment, and one of me with my new Scottish girlfriend, who did not show me her haggis, and it is just as well. After the awful photo of me in yesterday&apos;s post, I almost look ok in this 11 year old photo. Paris was grey and showery when we visited, as you can see. Gosh we had a good time with the women from Texas and Scotland. Don&apos;t read these with any sense of obligation, just if you find them of interest. It was a fascinating account of what went on behind the scenes and in front of the public that lead to the release of Australian refugee soccer player Hakeem al-Araibi from a Thai gaol where he was being held pending extradition to Bahrain. The cynic in me wonders if the outcome would have been the same had he been a plain looking non athletic person. I would like to think not, but....... He was only freed because of the extreme pressure being put on Thailand from so many directions, and even the Thai Royal Family was becoming concerned. The excellent and so interesting piece is at The Age. I tweeted today. I rarely tweet. It was directed to a bus company, Transdev, whose services are suspended past The Highrise while works at Southbank Boulevard are undertaken. I was in Brunswick today, by tram, then Richmond and ended up in South Yarra to pick up some medication. I was eating a pakora in Pran Central and I checked a tram app for a live time tram trip home. 7 minutes. I checked a few minutes later and my app still said 7 minutes. I suspected something was wrong and as I walked out of Pran Central, a tram went past. Damn! It was a warm day and the bus was stinking hot, hence my tweet to Transdev, the bus company, No air con in bus 380425. It&apos;s like a sweat box.. It seems that Instagram is the new way for models and photographers to network and find each other these days. I haven’t logged in to Model Mayhem in months. It was feeling increasingly irrelevant and arbitrary. A few months ago I was put in touch with Bob who was planning a trip to Australia. He had been recommended to me and I had been recommended to him which was a nice feeling. The previous download from our collaboration was the popular “Bunker”.